Ryanair, Europe’s No.1 airline, today (Feb. 5) reported a 12% rise in Q3 profit to €106m as average fares fell 4% to just €32 per customer. Traffic grew 6% to 30.4m with load factors up 1% to 96%. Unit costs fell 1% (ex-fuel unit costs rose 3%). “We are pleased to report this 12% increase in profits during a very challenging Q3. Following our pilot rostering failure in Sept., the painful decision to ground 25 aircraft ensured that punctuality of our operations quickly returned to our normal 90% average. Our AGB customer service programme, coupled with 4% lower fares, stimulated 6% traffic growth to 30.4m at an industry leading 96% load factor. After 30 years of successfully dealing directly with our people it became clear in Dec. that a majority of pilots wanted to be represented by unions. In keeping with our policy to recognise unions when the majority of our people wanted it, we have met pilot unions in Ireland, UK, Spain, Germany, Italy, Portugal, Belgium and France to discuss how we can work with them on behalf of our people. We have successfully concluded our first recognition agreement with BALPA in the UK, a market which accounts for over 25% of our pilots. When this process has completed, we expect to have similar engagement with cabin crew unions. While union recognition may add some complexity to our business and may cause short-term disruptions and negative PR it will not alter our cost leadership in European aviation, or change our plan to grow to 200m traffic p.a. by Mar. 2024. Our aircraft allocations may alter by base as we capitalise on new growth opportunities in France and Scandinavia. In Q3 we took delivery of 9 new B737-800’s. European airline consolidation and bankruptcies are providing more growth opportunities in the UK, Italy and Germany in particular. In Nov. we opened a base in Poznan (Poland) and in Mar. 2018 we open our 87th base in Burgas (Bulgaria). We recently announced flights to Jordan, our 34th country. Ryanair’s flight connections service was extended (in Jan.) to Porto following their initial success at Rome Fiumicino and Milan Bergamo. 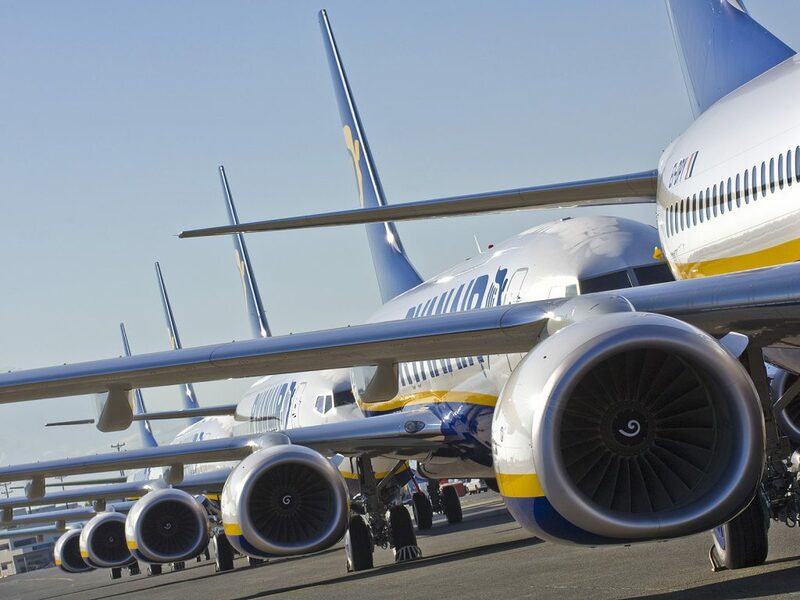 Ryanair enjoys significant cost leadership over other airlines in Europe. In Q3 unit costs fell 1%. Ex-fuel, unit costs increased by 3% primarily due to higher staff and EU261 costs arising from the Sept. rostering failure and our decision to cancel flights in Sept. & Oct. Staff costs will rise this year by an additional €45m as we roll out pilot pay increases of up to 20% and raise our crewing ratios in response to a tightening market for experienced pilots. Staff costs accounted for 10% of total revenue last year and we will not allow our industry leading productivity to decline. Our cost advantage on other (non-fuel) cost lines is significantly better than competitors and will continue to improve over the coming years as we take delivery of 210 B737-MAX-200 aircraft from April 2019. These “Gamechangers” have 4% more seat capacity, are 16% more fuel efficient and have 40% less noise emissions. Our capex on the MAX-200 is hedged at an average rate of $1.24. We recently concluded a 10-year maintenance contract with CFM for our B737-800 engines which will deliver substantial annual savings, as will our recent 7 simulator order with CAE, which will double our pilot training capacity over the next 3 years. Q4 fuel is 90% hedged at approx. $49bbl and FY19 is 70% hedged at just over $55bbl, well below current spot prices of c.$70bbl. Our balance sheet remains strong having generated over €1bn net cash from operating activities year-to-date. In the first 9 months of FY18 we have spent €1bn on capex, €639m on share buybacks and repaid over €300m of debt. The Board has approved a €750m share buyback of ordinary shares which will start in Feb. and, subject to market conditions, should be completed by the end of Oct. This latest buyback will increase the funds returned to shareholders since 2008 to over €6bn. Ancillary Revenue grew 12% in Q3. “My Ryanair” is on track to reach 40m members by Mar. 2018. The number of customers choosing “Plus” fares, reserved seating and priority boarding continues to rise. Ryanair Rooms recently launched travel credits making Ryanair.com the “go to” accommodation website for lowest hotel prices. In Nov. we opened our new Labs office in Madrid where we plan to employ up to 250 highly skilled IT developers over the next 18 months. From Jan., our customers are enjoying a bigger (20kg) checked bag allowance at lower bag check-in fees. We expect to improve the boarding experience, and on-time-performance, with the rollout of our new cabin bag policy, whereby priority boarding customers can bring 2 free carry-on bags (1 wheelie and 1 small bag) onboard, while all other customers still bring 2 carry-on bags free of charge but the larger wheelie bag will travel in the hold rather than in the cabin. We expect this improvement will substantially reduce flight delays due to bag offloads. We remain concerned at the continuing uncertainty surrounding the terms of the UK’s proposed departure from the EU in Mar. 2019. There remains a worrying risk of serious disruption to UK-EU flights from Apr. 2019 unless a UK-EU bilateral (or transitional arrangement) is agreed in advance of Sept. 2018. We, like other airlines, need clarity on this issue before we publish our summer 2019 schedules in mid-2018 and time is running out for the UK to develop and agree these solutions. We believe the UK government continues to under-estimate the likelihood of flight disruptions to/from the UK. We have applied to the UK CAA for a UK air operator’s certificate (“AOC”) as part of our Brexit contingency planning. We expect this process to take several months but to be complete well in advance of Sept. 2018. Our outlook for the remainder of FY18 is cautious. As we finalise union discussions along similar lines to that agreed in the UK, we expect some localised disruptions and adverse PR so investors should be prepared for same. In certain jurisdictions unions representing competitor airlines will wish to test our commitment to our low cost, high pay/high productivity model to disrupt our operations. We are fully prepared to face down any such disruption if it means defending our cost base or our high productivity model. We now expect full year traffic to grow 8% to 130m (from 129m previously guided). The final FY18 fare outcome depends on close-in Easter bookings (half of which falls in Q4). We expect FY18 fares will fall by at least 3%. Ancillary spend per customer should rise by 2%. Unit costs were adversely impacted by €25m non-recurring EU261 costs in Q2, and €45m additional staff costs in H2. While oil prices have risen in H2, we still expect FY18 unit costs to be down 2%. Accordingly, we maintain our full year guidance in a range of €1.40bn to €1.45bn. This guidance depends heavily on the absence of union disruptions, unforeseen security events and close-in Easter bookings.